How to draw Ulquiorra Cifer from Bleach. Learn basic drawing technique for Manga and Anime from step by step basic drawing lesson. In this tutorial you will learn to draw a Bleach character Ulquiorra Cifer with basic instruction for beginners or novices. Simplify your sketch first is one of the easiest way to learn how to draw and experience how the professional commercial artist draw it. The step by step images will explain how and why you should draw the easy way and very comprehensive. You will learn manage and simplify a complex drawing. 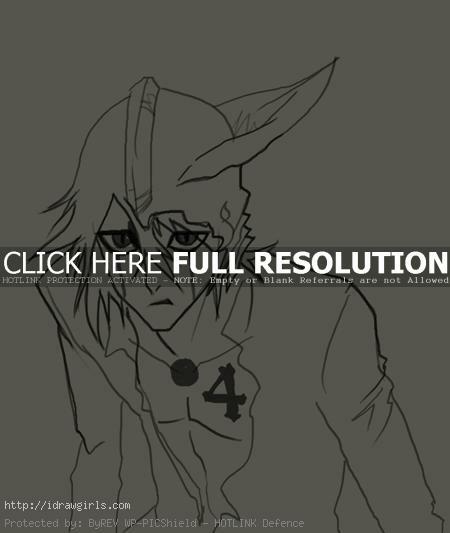 You will learn how to break down complex Manga drawing in to simple shape to start with. Then add necessary detail to complete the drawing that will look professional. Ulquiorra Cifer, ウルキオラ・シファー, is Espada cuatro in Aizen’s army of Arrancar, and is one of the series’ central antagonists, as well as one of Ichigo’s main Arrancar rivals. Ulquiorra is a slender, yet fairly muscular, male Arrancar of average height with a melancholic appearance, fairly short, messy black hair, pale white skin, a black upper lip, and green eyes. Ulquiorra is a very cold, callous, dispassionate figure, and is rather aloof, brooding, and indifferent, willing to harm both his comrades and enemies should they ever get in his way. He refers to anyone he does not find interesting as “trash” and treats them as expendable. Below are step by step how to draw Ulquiorra Cifer from Bleach. Step one, I drew basic geometry shapes for his head and shoulders. Step two, I added eyes, nose, lips and partial hair. Step three, I then drew his cloth, hair and helmet. Step four, I added more helmet shape and hair. Step five, I drew his thick eyelashes and slit underneath them all the way down. Step six, I finalize the drawing with darker line drawn.